More than 80% of America’s population is clustered in its cities. This, of course, is no surprise. After all, cities are where the jobs are, where public transportation makes it a snap to get around, where you can get a whole roasted pig head delivered with a single tap on your iPhone, where beautiful people congregate in herds. It’s where the entire world seems to be waiting on your doorstep. So, what’s not to love? Well, the traffic. The pollution. The indignant subway workers. The lack of open spaces. The paucity of gardening. And mostly the inability to commune with nature on a regular and sustained basis. Fast forward a century or so, and the idea of urban nature has become a renewed obsession for city planners and new residents alike. More and more Americans are waking up to the fact that the perfect antidote for the stresses of city life might just be nature’s lush green spaces. Wherever and however you can find them. 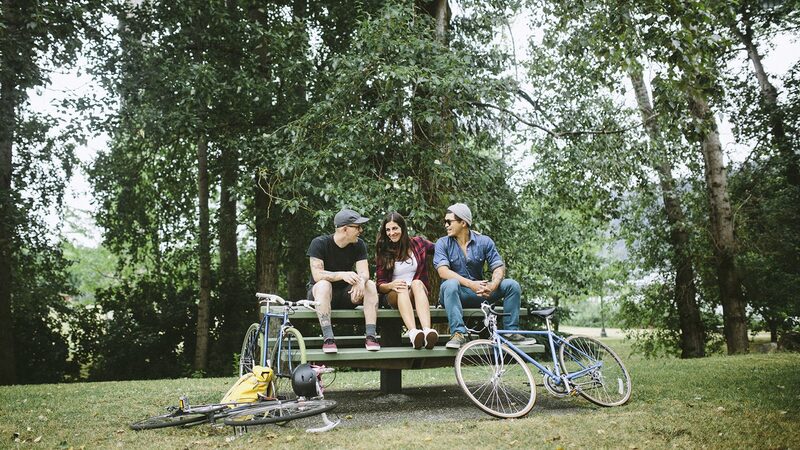 Bikers take a break in Portland’s urban oasis. Yup, the city known for its meticulously brewed coffee, bearded hipsters, and artisanal pickle shops also gets top marks for being in tune with nature. Just 10 minutes west of downtown, Forest Park is the largest urban forest in the country—its 5,157 tree-studded acres include more than 80 miles of soft-surface trails. Don’t like trees? (Um, what’s wrong with you?) Hop over to the snow-capped Cascades, the Columbia River Gorge, or the sparkling Pacific coast. Portland might have more diverse terrain to offer the adventurer than any other city in the country. Ski in the winter, surf in the summer, and hike, camp, and explore all year long.